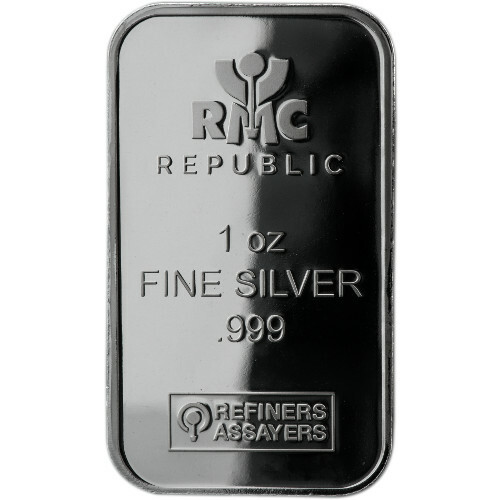 Silver.com is very pleased to offer one-ounce fine silver bullion bars produced by the Republic Metals Corporation or RMC. These cleverly designed pieces are a popular investment in fine silver and can make impressive gifts as well. The Republic Metals Corporation is highly esteemed for using advanced state-of-the-art green refining technology in producing investment-grade silver products. They are admired for utilizing production methods that are not energy-dependent while maintaining unprecedented efficiency. RMC has grown to become one of the most respected, innovative, and environmentally-sound mints in the world. Their consistent ambitious plight for innovative advancement has inspired many wise investors to develop collections of RMC pieces. Further reasons for RMCs popularity are their consistent output of premium quality products combined with an attractive aesthetic design. 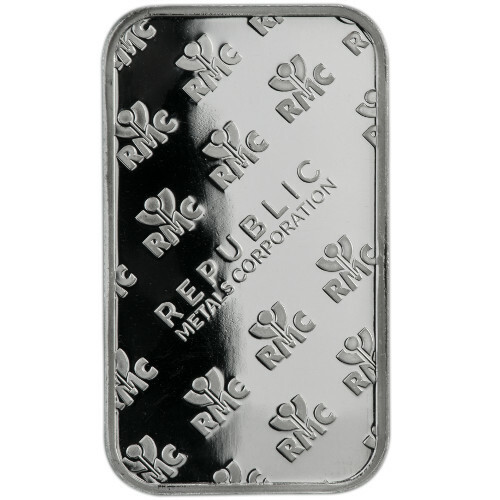 The obverse side of the Republic Metals Corporation bullion bar is boldly rendered with RMCs engaging trademark insignia along with the specifications of 1 TROY OUNCE .999 FINE SILVER. The reverse side of the bar bears a stately, modernistic, and intricate pattern of RMCs cleverly designed insignia. 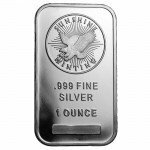 These elements combine to create a handsomely attractive bar of fine silver bullion. 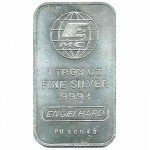 We are pleased to offer RMC bullion bars in an assortment of other sizes along with price reductions for larger quantities and a four-percent price reduction for orders paid by check and wire. Freshly minted RMC Bullion Bars are shipped in their original sealed packaging. 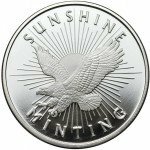 Silver.com provides free shipping for all orders over $3,000, which will be sent via USPS or UPS. Your order will be delivered to the destination of your choice and each package is fully traceable and insured against damage or loss. 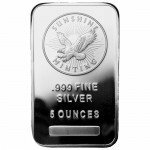 If you have any questions about the one-ounce fine silver bullion bars produced by the Republic Metals Corporation or any of the precious metal products in our catalog, you can get in touch with one of our representatives at 888-989-7223. We may also be reached through email or by live chat.